2. John Lacasse, born May 18, 1861 in Cranborn, Quebec; died January 31, 1936 in Skowhegan, Somerset, Maine, United States. He was the son of 4. Joseph Lacasse and 5. Marie Sarah Lucia Bolduc. He married 3. Delina Lilla Boivin 1890 in Skowhegan, Somerset, Maine, United States. 3. Delina Lilla Boivin, born October 07, 1869 in Skowhegan, Somerset, Maine, United States; died November 05, 1953 in Skowhegan, Somerset, Maine, United States. She was the daughter of 6. Jean Gaspard Boivin and 7. Henriette Morin. i. Olin Lacasse, born 1891; died 1953 in skowhegan, Somerset County, Maine; married Dora LEMIEUX. ii. Marie Mamie Lacasse, born April 19, 1893; died 1987; married Delor FOSTER October 01, 1917 in Skowhegan. iii. Joseph Francis Lacasse, born March 28, 1896 in Skowhegan, Somerset, Maine, United States; died April 28, 1981 in Skowhegan, Somerset, Maine, United States; married Delia SYLVAIN June 06, 1922 in Skowhegan, Somerset, Maine, United States. Comment: Ind: Skowhegan, Somerset Co., Apr. 25/18. Private. Org: Co A 147 MG Bn to Sept. 8/18; Co B 310 MG Bn to disch. Eng: St Mihiel; Meuse Argonne; Defensive Sector. Overseas: July 30/18 to May 6/19. Hon disch on demob: May 13, 1919.
iv. 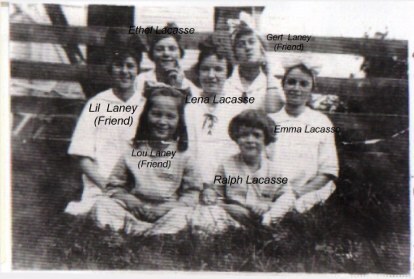 Ethel Lacasse, born August 19, 1897 in Skowhegan, Somerset, Maine, United States; died March 14, 1931 in Central Maine Sanitorium, Fairfield, Somerset, Maine, United States. v. Lena Lacasse, born October 18, 1900 in Skowhegan, Maine; died June 22, 1925 in Central Maine Sanitorium, Fairfield, Maine. vi. Mary Emma Lacasse, born August 04, 1902; died December 1994.
vii. Annie Lacasse, born February 23, 1908 in Skowhegan, Somerset, Maine, United States; died October 21, 1908. 1 viii. Ralph Edward LACASSE, born November 22, 1911; Died December 20, 2002 in Skowhegan, Somerset, Maine, United States; married Lucienne Amelia Amanda Cayouette LIVING in Skowhegan, Somerset, Maine, United States.